Hilltop retreat! 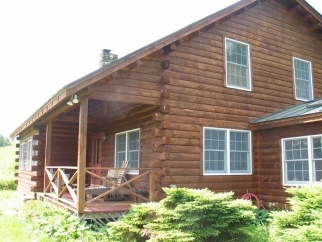 Enjoy White Mountain views from the south eastern exposure of this hilltop Log home. If you're looking for privacy, this is it up a long winding drive. House features open space with cathedral ceilings and post and beam interior with grand field stone fireplace in living room. Nice functional kitchen with sweet sun room off end. Sit on full length porch and enjoy vast views over Vermont fields. Sweet trout pond on property! Seller is also offering 236 acres just down road, sold separately.